Michael’s offers a large array of Art & Craft Classes including Art Painting, Cake Decorating, Jewelry Making, Paper Crafting, Knit & Crochet, Kids Classes, Birthday Parties and Card Making. 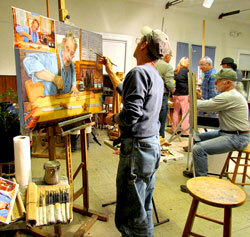 Daily and evening classes available including weekends. Check your local store location calendar for times. Park at the bottom of the hill. There’s two hills. One short one with a jump and another that is long. The first video above we go more down the big hill, but in the second we go more down the small one with the jump. Enjoy! ……….Click, Drag & Drop Gold Person (top left corner) for Panoramic View. It’s Fun! Just 20 minutes north of Salt Lake City, the Davis Conferece Center is nestled in the heart of thriving Layton, Utah. And, just off of Interstate 15, the Center is in a premier location surrounded by everything you’d want in a resort destination. With over 70,000 square feet of premium meeting space, integrated presentation amenities, wired and wireless high-speed internet access, and inspiring architecture, the Davis Conference Center is designed to deliver stellar results in a majestic setting. And, being attached to the new Hilton Garden Inn Hotel provides every comfort you can imagine. The Davis Conference Center is the center of everything! The Meridian Grand Ballroom has 12,562 sq. ft. of meeting space that will seat up to 900 guests for a banquet. The Eclipse Expo hall boasts 18,000 sq. ft. of exhibit space featuring 30 ft. ceilings, 18 ft. roll up door, in-floor power/internet/phone and much more. The Stratus Ballroom has 7,000 sq. ft. and can opens into the Eclipse Expo Hall creating 25,000 continuous sq. ft. of pillarless exhibit space. There are 20 break-out rooms featuring automated hide-away screens, XM satellite radio selections, and some rooms have built-in 2500 lumen LCD projectors. The serene and picturesque Solstice Courtyard is an expandable outdoor venue available for socials, receptions and other events highlighted with a fire pit, water feature and incredible steel trellises. The Cirrus Atrium is a glass-enclosed rotunda overlooking the courtyard perfect for a wedding reception line or socials. 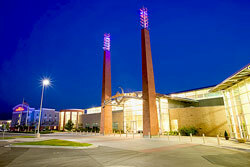 Two landmark weather towers forecast the next day’s weather through LED flood lighting, establishing the “weather theme” throughout the center. Our signature Continuous Break Stations are the latest in efficiency and service, providing impeccable food at affordable prices. The Conference Center and Hotel feature high-speed wireless internet access… roam anywhere and be connected. Wasatch Crossfit Boot Camps are a great way to get fit while having fun in a supportive atmosphere. By using the Crossfit training you can get the lean toned body that you deserve. You’ll also have fun and enjoy meeting like-minded motivated people. We’ve trained everyone from senior citizens to distance runners to elite athletes. Boot Camp is for individuals who are committed changing their life in a positive supportive atmosphere. Every Boot Camp includes 12 weeks of nutritional counseling including weekly measurements, custom menus, and meal planning. We’ll even help you with your grocery shopping list. An hour with a personal trainer is typically $50-$75. Our Boot Camp is less than $20/session and you’ll get world class coaching.